Outnumbered Mom: Boy Moms! Stereotype, anyone? My math teacher son will be appalled by the graphic, but it's true: some stereotypes just don't add up. The other day, I started thinking about those stereotypes it's easy to buy into...and how wrong that can be. So I made a list of Things Your Boys Aren't. 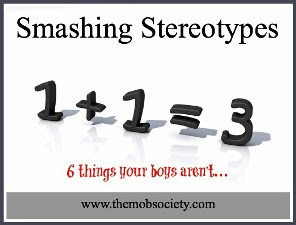 Click on over to The MOB Society and join a bunch of other boy moms as we smash stereotypes. P.S. I'm participating in 31 Days, posting every day about 31 Days to Rest. But this just didn't quite fit in my 31 Days series today. Being a boy mom has nothing to do with rest.